This page describes the operation of the City of London Corporation of the Poor and its workhouses. Separate pages give information on the City's parish workhouses and on the post-1834 City of London, East London, and West London poor law unions. For Soul and Body, are so well prepared. The Corporation's activities came to a halt with the Restoration in 1660 when Charles II took back his properties. The 1662 Settlement Act included a provision for corporations to be created in the City of London, Westminster, and parts of Middlesex and Surrey. The new corporations were empowered to erect workhouses, and in 1664, Middlesex spent £5,000 on setting one up in Clerkenwell at the corner of Corporation Lane (now Corporation Row) and Bridewell Walk (now Northampton Road). The workhouse supplied materials for the poor to work on in their own homes and was also used for 'the reception and breeding up of poor fatherless or motherless infants.' 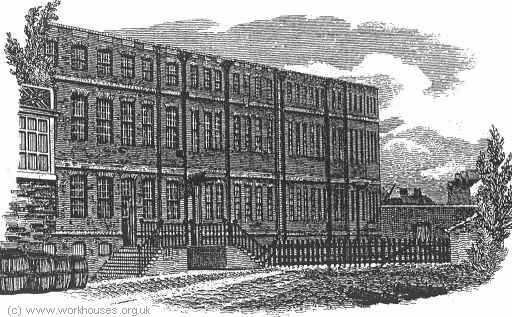 The Middlesex workhouse was not a success and closed in 1672. As far as the City of London was concerned, shortage of funds, together with the plague (1665-6) and the Great Fire of London (1667), resulted in little further activity. The City of London Corporation was revived by a further Act in 1698. The Corporation was governed by the Lord Mayor as President, the City Aldermen, and fifty-two Citizens, chosen by the Common-Council, as assistants. The Corporation's original plan was to provide work for the poor who would continue living independently. A scheme was set up to run for seven years which would employ a thousand able-bodied poor in spinning wool (Hitchcock, 1985). However, the costs of running the scheme evoked complaints from a number of City parishes and it was dropped and a residential workhouse established instead. 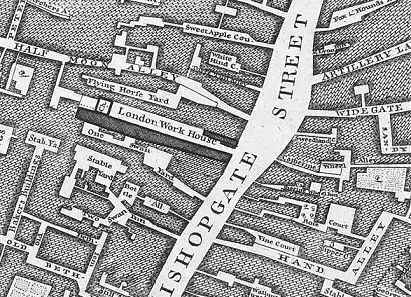 According to John Strype in 1720, the intention of the Corporation's workhouse, located on Bishopsgate Street, was "to employ all the poor Children, Beggars, Vagrants, and other idle and disorderly Persons that are, or can be found within the said City of London and the Liberties thereof. " Such for whom no Settlement can by Law be provided. Such whose poor Friends being much oppressed by a great Charge of Children, or are reduced by Misfortunes to such Circumstances, that they cannot provide for them themselves. Such who are the Children of Seamen and Soldiers in the QUEEN's Service, many of whom lose their Lives therein, or are otherwise rendered incapable of providing for their Wives, Children, and Families. Such who are commonly known by the Name of the Black Guard, who too commonly lived upon Pilfering Sugar and Tobacco on the Keys, and afterwards became Pickpockets and House Breakers, many of whom at last have received their due Rewards, and made their Exits at the Gallows; which are now kept to Work, and get their Livings honestly in the said Workhouse. The children, up to 400 in number, were taught to read and write, and given work to do until they could be put out to be apprentices, sent to sea, or "otherwise disposed." Beggars and Vagrants — "those Sturdy and Insolent Men and Women who live in the Skirts and Out Parts of this City, and Places contiguous thereto, and other Stragglers and Wanderers, who too frequently resort to this City. Which when Apprehended and Taken, are in the said Workhouse kept to hard Work and Labour until they are by Law discharged therefrom." Idle and Disorderly Persons — those Rogues and Vagrant Men which are there kept until they are put into the QUEEN's Service by Sea and Land; and those ill Women which are taken up in the Streets, Debauching the Youth, and others of this City, many of which, rather than be continued to Work and Labour, voluntarily transport themselves to the Western Plantations whereby this City and Nation is rid of them." The workhouse was "a very strong and useful Building, and of large Dimensions, containing (besides other Apartments) three long Rooms or Galleries, one over another, for Workhouses, which are all filled with Boys and Girls at Work, some Knitting, most Spinning of Wool; and a convenient Number of Women and Men teaching and overseeing them; Fires burning in the Chimneys in the Winter time, to keep the Rooms and the Children warm. And they intend (if they get Money) to pull down the rest of the old Houses, where now also the Poor and the Vagrants are kept at their several Works, and to build a fair Court answerable to the foresaid New Building, which is on the Southside thereof." As to the inmates, Strype noted that: "they brew their own Drink, having in the New Building Erected a large and convenient Brewhouse, and over that a Malthouse. They kill their own Beef and Mutton; and have for that Purpose a Slaughter House; but since they find it better Husbandry to buy their Meat of the Butcher. And in case of Sickness, broken Limbs, or Sores, or Wounds, they have Advice, Physick, and Surgery gratis." As regards the workhouse food, Strype recorded that it was "plain but wholesome and sufficient. They have Breakfasts, Dinners, and Suppers every Day in the Week, and a constant set Allowance each Day. Their Stint each meal for Bread is four Ounces; for Cheese an Ounce and an Half; for Butter an Ounce; for Small Beer what is sufficient, not exceeding a Pint at a time of 7s. a Barrel. Their Breakfast, Sundays, Wednesdays, Thursdays, and Saturdays, is Bread and Cheese, or Bread and Butter, and Beer. On Mondays, a Pint of Pease Pottage with Bread and Beer. On Tuesdays, a Plumb Pudding Pye of Nine Ounces, and Beer. On Wednesdays, a Pint of Furmity. On Friday, a Pint of Barly Broth, and Bread. On Saturday, a plain Flower Sewet Dumpling with Beer. Their Supper always the same; to wit, to each four Ounces of Bread, one Ounce and half of Cheese, or one Ounce of Butter, and Beer sufficient." The children all wore clothing made from "Russit Cloth", with a round badge worn on the breast representing a poor boy and a sheep. The workhouse motto was: "God's Providence is our Inheritance." The workhouse had a large room used as a chapel and a dining room. Prayers were said at 6am and 6pm. On Sundays, the inmates all went to church at St. Helen's. May it please Your Most Excellent Majesty: To Pardon this great Presumption in Us poor Children, who throw our Selves at your Royal Feet, among the Rest of your Glad Subjects, who here in Crowds appear to behold Your Sacred Majesty. We, MADAM, have no Fathers, no Mothers, no Friends; or, which is next to none, those who through their Extreme Poverty cannot help us. God's Providence is our Inheritance [Pointing to the motto on his breast..] All the Support we have is from the Unexhausted Charities of Your Loyal Citizens of London, and other Your Good Subjects, and the Pious Care of our Governors, who are now teaching our little Hands to Work, and our Fingers to Spin. These Threads, MADAM, [Holding some yarn in his hands] are some of the Early Fruits of our Industry. We are all daily employed on the Staple Manufacture of England, learning betimes to be useful to the World. And there seemed nothing wanting to compleat our Happiness, but the Opportunity which this Day affords us, of being the Objects of Your Tender Pitty and Compassion. One Gracious Smile from YOUR MAJESTY on this New Foundation will make us Live, — and Live to call You Blessed. " And may God Almighty long Preserve YOUR MAJESTY for the Good of these Your Kingdoms, and Your Royal Consort the PRINCE. So Pray We, Your Little Children: And let All Your People say, AMEN. 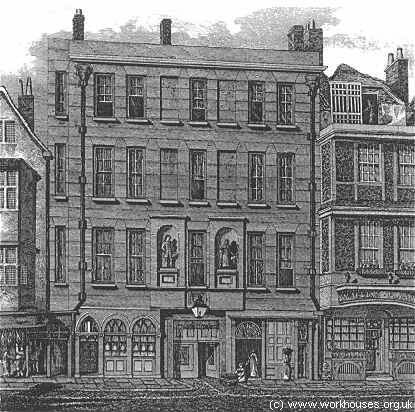 In August 1699, the Corporation took a House in Bishopsgate-street, and were at great Charges in building and fitting up the same for a Work-House; into which they received from the Church-Wardens such Children as were a Charge to the several Parishes, they paying a Weekly Allowance toward their Maintenance. In November 1700, they began to receive, on the Keeper's Side, Vagabonds and sturdy Beggars; and thus they proceeded, by degrees; it being impracticable to execute all Parts of the Act at once. The Corporation, according to the Title of the Act, began with the Relief of the Poor, and taking in Children, whose Necessities People are commonly most apt to pity; the good Fruit that was likely to be produced from the Education of such Children, and bringing them up to Labour, rais'd up many Benefactors; and in October 1701, the Corporation admitted Children upon the following Terms ; every benefactor that contributed 25l. was allowed to recommend a Child ; and in a short time after the setting up this Work-House, the same was regulated and adapted to the several good Ends and Purposes of the Act of Parliament. This Management was approved by the Common-Council, and a second Supply granted in 1702 ; and the several Orders touching the Matters aforesaid were confirmed, and made By-Laws. But afterwards in November 1708, it was ordered, that no Child, altho' born within the City of London, and Liberties thereof, should be received from any Benefactor, giving a less Sum than 50l. yet, that the Charity might not be too strictly confined, it was further ordered, that any Benefactor giving 70l. might put in a Child from what place he thought fit. The House is divided into two Parts, one call'd the Steward's Side ; and the other, the Keeper's Side. In the Steward's Side, poor Children are taken in from Benefactors, giving 50 or 70l. as beforementioned ; On this Side are also taken in such Children, as are a Charge to the several Parishes of this City and Liberties to which they belong, and all of them religiously educated, according to the Church of England, and employ'd in spinning Wool, or Flax, or else in Sewing or Knitting. They are dieted and cloathed, and duly taken Care of in Sickness by two Physicians, a Surgeon, and an Apothecary ; they are also taught to read, write, and cast Accompts, whereby they are qualify'd for Services, and honest Ways of Livelihood. In the other Part, call'd the Keeper's Side, Vagabonds, Beggars, Pilferers, lewd, idle, and disorderly Persons, committed by two of the Governors, have such Relief as is proper for them ; and are imployed in beating Hemp for Twine-Spinners, Hemp Dressers, Linnen-Weavers, Shoemakers, and other Trades ; as also washing Linnen for the Children on the Steward's Side. The Weekly allowances, which were formerly Two Shillings and Six-pence a Week for each Child, put in by the respective Parishes within the Liberties of the City of London, were afterwards reduced to Two Shillings, and are now Eighteen-pence a Week, for maintaining and teaching every Child put in by any Church-warden of the Parishes aforesaid; and 'tis hoped in time, by the Accession of Benefactions, the Charge may be reduced much more. And tho' the Act of Parliament for supporting this House, requires the Common-Council of the City of London, upon a Certificate from the Corporation, of their Want of a Supply, to levy the same on the Citizens from time to time, not exceeding one Year's Rate for the Relies of the Poor; yet since 1713, there has been only half a Tax levied, amounting to 2300, or 2400 pounds, which was wholly laid out in building the Prison-part, the Chapel, and other Accommodations for the House. The Work-house (exclusive of the Chapel and Prison-part) contains above 200 feet in length, has three Rooms one over another, about 150 feet in length ; the lowest of which is the Work-Room for Boys, the second for Girls, and the third Room has two Wards for lodging the Boys. The Girls Ward is over the Chapel, which separates the Work-House from the Prison-side. There are now 129 Children, taught, cloathed, and maintained in this House : The Work they are employed in, is spinning of Jersey ; but considering that 20 or 30 Boys are constantly attending by turns, in the Reading and Writing Schools, about two Hours every Day, Sundays excepted, what they earn being about Two-pence a Day each Child, does not more than pay the Charge of the Master of the Childrens Work, the Under-teachers, the Wheels, and Waste they make. Of the Girls, there are ten by Turns kept at the Reading and Sewing School, for making up and mending the Linnen for the Boys and themselves ; and about the same Number are also by Turns employed in knitting and footing the Childrens Stockings : For this Reason about 80 Wheels serve for both Boys and Girls. Note. These Wheels are bought in Old-Bedlam, for Sixteen-Pence a-piece ; and eight Reels bought there at the same Price, serve the House. In Summer-time, Beans, Greens, and Roots, are allow'd as the Season affords them. The Children attend Prayers twice every Day in the Chapel ; and the sturdy Beggars, and loose People, who are now in Number about 34, attend there in a Place by themselves. ...a long brick edifice four hundred feet in length, consisting of several work-rooms and lodging rooms for the vagrants and parish children brought thither, who are employed in spinning wool and flax, in sewing, knitting, or winding silk, or making their clothes or shoes, and are taught to write, read, and cast accounts. The grown vagrants brought here for a time only are employed in washing, beating hemp, and picking oakum, and have no more to keep them than they earn, unless they are sick; and the boys are put out apprentices to seafaring men or artificers, at a certain age, and in the meantime have their diet, clothes, physic, and other necessaries provided for them by the house, which is supported by private charities, by sums raised annually by the City, or by the labour of the children, which last article produces seven or eight hundred pounds per annum. City of London workhouse — West Front, or Principal Entrance, 1819. City of London workhouse — Stewards' Side, 1819. In 1829, a private Act of parliament paved the way for the disposal of the Bishopsgate site as the workhouse had "become unnecessary for the purposes for which the same was established, and on account of the removal of the labouring poor to the out parishes in the neighbourhood of the City of London, and the erection of Houses of Correction and parochial workhouses within the said City, the same has fallen into disuse: and... is very much out of repair and it would cost a considerable sum of money to rebuild." The site of the Bishopsgate workhouse was redeveloped in the 1870s with the building of Liverpool Street Station.